The book is written in chapters that pretty much follow each game through the season, and in a nice touch, the results and tables are printed at the end of each. 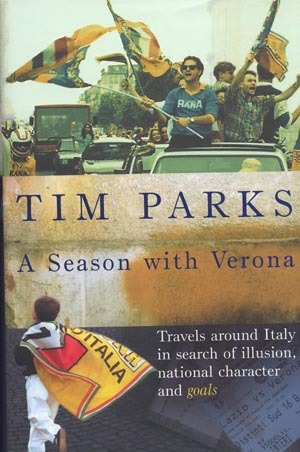 This allows the reader to follow the ups and - mostly - downs of Verona as they struggle to maintain Serie A. And a mighty struggle it is, given that they're basically crap. Hellas Verona has a reputation as having a "racist" fan base, but things are not always what they seem - at least when you're smack in the middle of the Curva like Parks. Parks is fairly well known on some other non-soccer related drivel about Italy :) No matter, we can forgive him those transgressions. He reveals himslef as a true soccer fan (or nut). At times he waxes philosophically about some topics that while not totally irrelevant (well, perhaps), are hardly key to the story. It's like he had to get something off his chest. OK, you can indulge him and then skip over it to get back to the Lazio merda!, Vaffanculo Milan!, Bastardi! and other choice terminology. In fact, he has the makings of a very useful addition to the Abseits Serie A Lexikon. And the story of the season itself, well, Parks certainly couldn't have asked for a more dramatic plot. Made all the more riveting by the rise of city rivals Chievo. This book is highly recommended. I don't normally have much use for Italian soccer, but this not only gives some useful insight into Italian culture, but it's top notch soccer literature as well.